Don't let anyone walk off with your helmet! Lock it right to your bike with our Chrome Universal Helmet Lock. Works on engine guards, frame tubes, or any other 7/8" to 1-1/4" tubes. Works on engine guards, frame tubes, or any other 1-1/4" to 1-1/2" tubes. 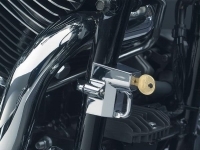 Add this License Plate Helmet Lock & conveniently lock your helmet to your motorcycle. 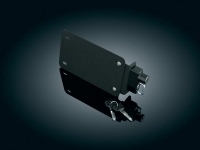 The simple little mounting plate easily bolts to the back of almost any motorcycle & allows the easiest access for locking your helmet.